and we have had a highly unusually cold winter. For the first time in the ~13 years I've had the pond, I have had some winter issues with the fish. First my Shubunkin had dropsy which I attributed to possible hypothermia. one looks great and seems happy, fin on back raised, but the others seem stressed fins down. Two have a fuzzy white appearance almost like the slime coat is "peeling" off. Been monitoring water quality and the ph and kH are low, from the antibiotic killing off beneficial bacteria? and am hovering at 1 for ammonia, which I know is still high. My question is, are these large water changes ok, or stressing fish more? Is the white stuff disease or symptom of ammonia poisoning/water quality? Should I add some salt? I do have plants in the pond, iris, pothos, tropical water lily I'm overwintering, white calla lily and a lucky bamboo. It's been over a week since the antibiotics and I've added beneficial bacteria several times. I am just at a loss. Hi there, I'm so grateful to you guys, the site is fantastic. I should have written and asked for advice before. I also apologise in advance for this long email. And for the fact that I still don't have a proper testing kit for nitrate and ammonia. I've ordered one online and it should arrive in the next couple of days. Just as an introduction, I have eight goldfish in a 400 litre pond, ph 7.0. Its in my tiny front yard, taking up most of the garden, the fish are sheltered by water lilies and overhanging ferns. Its very popular with the neighbourhood kids who all stop and admire the fish every chance they can get. 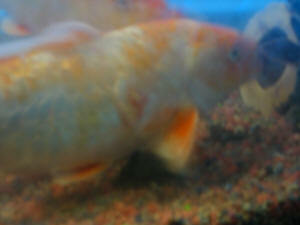 Another of my fish, a male Shubunkin, is currently in a separate hospital tub of 200litres, ph 7.4. I've had three of my fish, two comets and the Shubunkin, maybe four or five years, all bought from my local pet shop when they were tiny. These are the ones that had the other 'babies', but of course the babies are now huge. The two original female comets are about 30cms long (12inches), the Shubunkin and a couple of the Shubunkin x comet 'babies' are around 10inches. The rest are about 8inches minimum, except for one 4inch fantail (which I suspect came in on some plants I bought on eBay). When I got the original three they were so small, and I'm ashamed to say, but I had a small bowl with no filtration. My current 400litre pond is the third, and I now have a huge ClariTec 15000 biofilter, hooked up to a Stingray 7000 Pond Filtration Pump. I bought the current pond two years ago, and the goldfish grew dramatically after I bought it. It was astonishing how much they grew. I feed them floating pellets and peas. I do 30-40% water changes once every week or so, using various water conditioners, currently Prime. The fish are really tame and swim between my hands. They're lovely fish. I'd hate to lose any of them. The thing is, the current pond is now too small, and I suspect this may be one cause of my current problems. I want to get them a bigger pond, but at the moment I don't have anywhere to put it. About six months ago I noticed my original Shubunkin had developed skin that felt like sandpaper. My first thought was white spot, and I took him out and tried a ten day salt treatment to no avail. (Epsom salt, rock salt, baking soda and Melafix.) None of the others had sandpaper skin or any visible spots. I know this is silly but he seemed quite upset about being separate so put him back with the others. (I know this is incredibly silly but I wasn't thinking straight due to various other things that were happening at the time). He was swimming around rapidly by himself and calmed when I put him back. Anyway, I then tried Aqua Master Rapid White Spot Remedy on the whole pond to no avail. I used up 2 lots of 500ml of the stuff, as per the instructions, so its not as though I didn't try for long enough. I later tried Paracide and paragone. Nothing got rid of his sandpaper skin. I've read about the dangers of over medicating and this all happened over a 4mth period, which yes, is probably way too much medication over that time. The other fish seemed fine while this was going on and I was desperate. Of course I was asking the advice of people in a few different fish shops and they just kept flogging me different treatments. In the meantime I was searching the web and couldn't find any symptoms similar. The only information I did find said 'sandpaper skin' meant the fish had 'had it', or referred to some obscure incurable disease in wild fish which once you saw this on their skin meant it had already got into all their internal organs and caused irreparable damage. It was when the Shubunkin started swimming frantically up and down the pond one day that I finally put him in a separate 200litre outdoor tank, 2mths ago now. He was really going psycho. At this point I was really desperate and was convinced he was going to die in the next few days. He'd become very thin, especially compared to the others. I then tried Waterlife Protozin and later Sterazin on him to no avail. Even just writing this I'm horrified at the medication I've inflicted on him, but I was desperate and didn't know what else to do. My Shubunkin didn't die however, and he's been in the 200litre tub about 2mths now, with a biofilter and a 3500 litre per hour pump. (This tub has algae that just won't go, which I realise after looking more at your site is probably because I've been overfeeding.) Anyway, after I tried the Parazin my fish's symptoms started to change. (I don't know whether these changes really had any connection to the Parazin, the weather in Sydney was really hot around that time too.) What happened was that my fish started to get white raised skin, like healed raised scar tissue, where his dorsal fin joins his body. White spots up to 1mm diameter started to appear and slowly erupt from that tissue, not as a cyst, but in a long white thread. (Sorry I know this is gross.) The sand paper skin on the rest of his body didn't change. During the Parazin treatment the erupting white spots just kept appearing and the raised scar tissue like skin just got worse. I think it was just under a month ago I decided to give my fish a salt bath and finally I found this seemed to have some effect. What looked like little black worms and longer white worms came out of his body. He seemed calmer after it was over though he really hated it at the time. His swimming around frantically became less frequent afterwards too. No more black worms have come out since the first salt bath I gave him. What still appears to erupt from his skin during the salt baths are the long white threads - from the white spots, as well as the rest of his body. I just don't know if I can keep doing the salt baths, how long it will take to finally work and if it eventually will. I feel so sorry for my poor fish, the Shubunkin. He's such a beautiful fish with a lovely long tail and I hate doing all this to him, its like torture, I can't believe he's survived the whole process to this point. Plus I know goldfish are social and I don't like leaving him by himself. Yet throughout most of this time his appetite has been good, and since I separated him I've been spoiling him by giving him frozen brine shrimp mixed with Spirulina (too much obviously). He loves that and devours it. Unbelievably he's now looks like he putting on a little bit of weight. If you could please let me know your thoughts on all this it would be so much appreciated. The whole process has been horrible. I've been doing as much reading about fish diseases as I can and I've not come across anything like the symptoms my fish is exhibiting. And thank you for your patience with this long essay, and for all the time and care you've put into this site. and given the visible black spots in the white, do you think its some kind of parasite? Have you heard of anything similar where raised skin that looks like scar tissue has grown at the base of a fish's dorsal fin? I would like to start by saying that I have been using your site for a couple of years now and find it a valuable research tool for both my aquarium and my pond. Keep up the brilliant work. My question regards the size of my pond and the number of goldfish in it. I have researched your site for the appropriate number of fish for the size of the pond but require some additional <sic> advise. The half barrel, with the fish in, is supported by a second barrel which houses my own design of biological / mechanical filter, in a third barrel and the pump (The attached photos will illustrate how it is constructed.). I have had the pond for 5 years, four years with 5 x gold comets in it. Last year I added 15 x little Tetras and had them all living very happily together until winter. I removed the Tetras to a planted aquarium indoors and decided to replace these with 4 x small yellow comets this year, after I had refurbished the pond in May. When I calculate the ratio of fish to the ponds surface area, should I calculate the area of both barrels or just the one with the fish in it? I understand that only the volume of the primary barrel is important for the fishes space requirements, but what about water quality parameters?. I use the volume of both barrels when calculating any medication doses. I am asking this because many of my fish have become ill over the last two weeks and I'm trying to do everything I can to fix the problem, using advice from this forum as well as a couple of others for a second opinion. 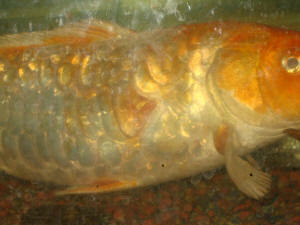 1 x gold comet has become lethargic and prefers to hide The other fish are active and eat well. The average size of the gold comets is 12.8 cm long and the yellow comets are 9.6 cm. Following much research I realise that this might be too many for their space requirements, but what about the quality of the water? I used to believe I could keep more fish in the pond if I had good filtration and a high flow rate of water through the filters, hence my pond and filter barrel design. I'm beginning to wonder if this was the right thing to do. I have a total of 90 cm of fish in approximately 0.2 m3 of water (both barrels) with a combined surface area of 0.669 m2. The problems have all occurred since I refurbished the pond, after the winter period, by removing the plants, cutting their roots back and re-potting them, removing debris from the bottom of the pond and cleaning out the filter. From my own research it looks like I have affected the natural balance of the pond by removing the plant roots and replacing last years filters with new ones. I only started feeding again in March when the water temperature rose above 8 degrees. I stopped feeding them in December. Thread algae has also started to grow vigorously, some of it is removed daily but I maintain a patch of it on the slate stone, in the flow of the water from the pump, to house any good bacteria and act as a food source. I perform regular water tests every two weeks and acted when my tests showed elevated Nitrite & Nitrate. After this reading I carried out a 20% water change, using Tetra Pond's AquaSafe to condition the new water and then medicated with Tetra Pond's MediFin. The health of the fish continued to deteriorate and 1 x yellow comet was already showing signs of Dropsy and placed in a separate tank. My next water test, prior to a 25% water change and addition of salts (Epsom Salts, Bicarbonate of Soda & Maldon Sea Salt) in the ratios described in the FAQ but halved to give me a 0.05% concentration, to protect the plants and bacteria. The Hospital tank had a higher concentration..
26/04/10 pH 8.5, Ammonia 0.1 @ 10 degrees, NO2 0, NO3 0.
eating it. I am not feeding them anything else for 3 days. Primary Barrel = 80 cm diameter x 35 cm deep. Secondary Barrel = 46 cm diameter x 30 cm deep. River Pebbles on a plastic support grid over 3 layers of graduated foam filter with the most open at the top, the least open at the bottom over approx 150 pieces of 30mm diameter ribbed pond hose, cut to approximately 25 - 30mm long acting as an environment for good bacteria. The pump draws water through the filters via a sealed exit point at the bottom of the third barrel and returns it to the pond. This set up allows me to maintain a constant depth of water in the pond, because of the weir. Any loss of water is buffered by the secondary barrel and it is here that I normally top up the water, although medication and water conditioning is done by adding it to the water which flows over the slate stone.